Drilled and slotted rotors are a gimmick. If they actually cooled quicker and faded less, then why don't race cars use them? Less metal for heat dissipation, greater chance of cracking, and accelerated pad wear. Mine with the Z36 powerstops looked identical. Two of my caliper slide pins were stuck. Only got about 40k km on em. New Z36 pads and had the rotors turned. Those rotors would have been fine to have turned. Slotted and drilled rotors aren't necessarily made to last longer. They're made to cool quicker with less fade. I mean no offense wit this post. Yeah, I see this claim made on every car or truck forum I visit. 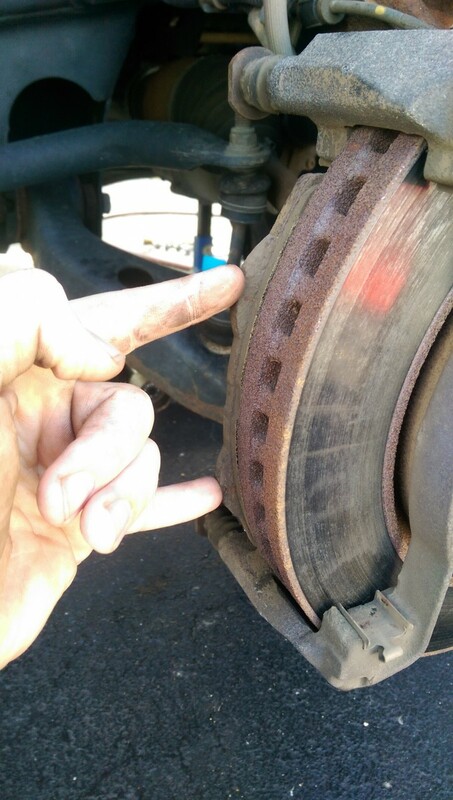 That said, I do believe people have seen these rotors crack. Believe what you will. Ferrari runs drilled rotors, Porsche runs drilled rotors, many NASCAR vehicles run slotted rotors, Super Trucks run slotted rotors, many high performance bikes run open slot or drilled rotors. 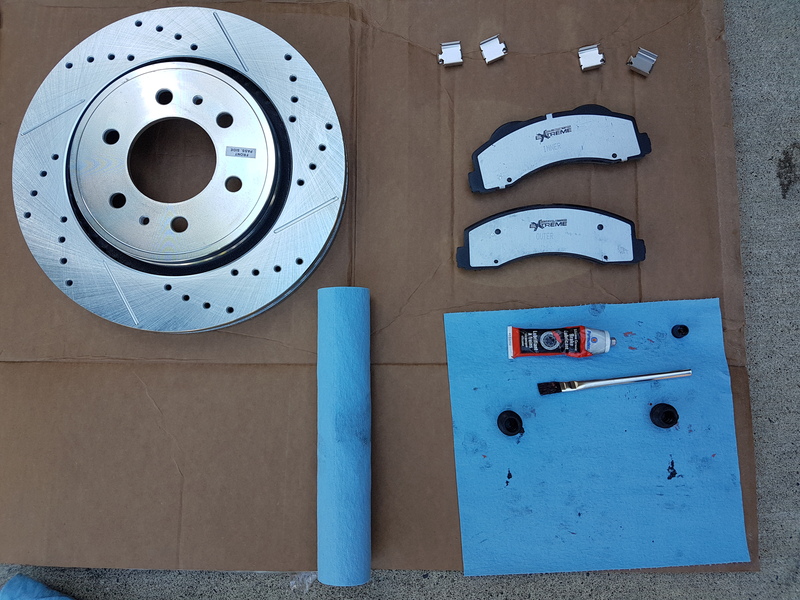 Slotted and drilled rotors got a bad name when first introduced as an option for daily driver. People had them cracking right left and center. I myself had an early set of PowerStop rotors crack on me that was 17 years ago. I’ve run 4 sets since that time that have given me zero problems and that offered superior braking. I believe the industry has adjusted, better friction material in the pads and better metal or carbon fiber available in the rotors. I don’t see the complaints on these with todays products. I’d like to see stats on heat dissipation between the two from the comment referenced above. You know, empirical data that shows the same rotor under both circumstances. I simply do not believe that a rotor that is drilled to align with the rotor vanes would cool more slowly and not run cooler than a non drilled rotor. It’s very hard to argue that the pads gasses do not dissipate more quickly with a hole or slot their to void them. Anyway there is much to read on this subject and good arguments made on both sides of the equation. I’m not defending my slotted and drilled brakes, heck, I’m not even running them. Now do I believe that a $35 drilled and slotted rotor is going to hold up, probably not. You get what you pay for. Last edited by GearHead_1; 01-10-2019 at 10:36 AM. I have not taken apart the front of a F150 yet but your caliper should float back and forth some on some pins. If they are not you can get uneven wear on one pad or the other. You may need to clean up and grease the mechanism so they can float. This is true, however I have seen examples where the caliper was floating fine on it's pins, but the pad's dog ears were wedged/seized in the bracket and not backing off the rotor properly. That pad needs to have some give to it so it's not riding on the rotor when the caliper is not loaded. I had one of the pins on my driver's side caliper get completely seized, which was not fun trying to get out of the bracket. I'd recommend changing the slide pin boots whenever you change the pads/rotors, as they were the core cause of my problem. Some brake kits include new boots and pad brackets, some don't (my StopTech Kit came with brackets, but not boots for instance). Sign up for Stage 3's Newsletter! 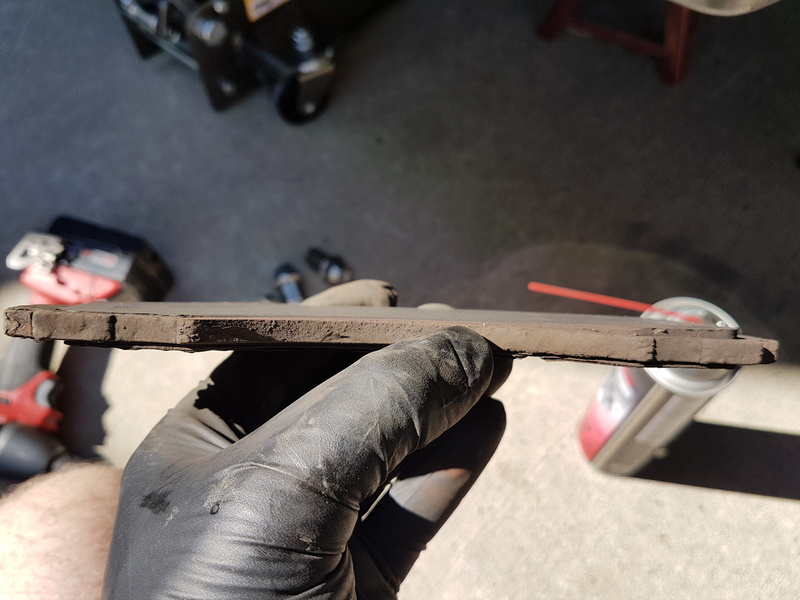 When I did my brakes the problem I ran into was the bracket that holds the pads. It got rusty and the areas where the new hardware goes was "swollen". I could tell when I put the pads in that they didn't "float" properly. It they don't float with some movement, you will have a binding or dragging situation. If they don't float, change that bracket. Also using SS hardware helps keep that groove from getting corroded and seizing the pad. Those rotors in the photos look to me like they overheated. The pad material got too hot and spread on the rotor like butter. Once that happens you are out of luck for the rest of the pad life because excessive pad material on the rotor surface will chew up the pad. You can see in the slots how much pad material is on the rotor. I should replace the bracket that holds the pads. The pads seemed tight. What a hassle. If you buy the caliper, you get the bracket and caliper. I just want the bracket. It was 40°F on Monday, now it is 10°F. I won't look into it until it gets warmer. I found Rockauto has the caliper bracket for sale. A-1 Cardone 141098 (#AL3Z2B292A). I have never heard of A-1. Do I take a chance and see if that fixes the problem? The pads were pretty tight when I tried to put them in the bracket. Last edited by Lizardking419; 01-10-2019 at 11:06 AM. Don't replace the bracket just file the the tabs on the pad ears. I do this on every brake job to make the pads fit. As long as the surface under the stainless strip is clean and free of debris it's fine. 2011 XLT Screw 6.5' Box, Tux Black, 4" BDS lift, 34" BFG KO2 tires, 18x8.5" +18 XD spy Wheels, PTM oem Flares. Rampage Slimline nerf bars. 5* Tuned 87 P/T. There are more than 3.6 million 2009-14 Ford F-Series trucks on the road today, and the majority of these are the F150 model. The 12th generation of the truck, and specifically its brake system, has had very few problems, since most of the brake system was carried over from the previous platform. 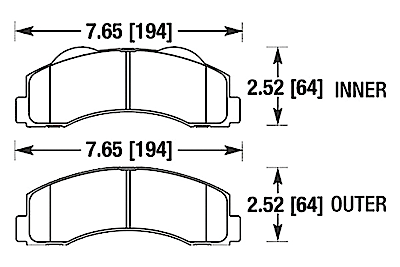 For the 2010 model year, Ford made some changes to the brake caliper and pads; namely, the inner and outer pads are different. If the pads are mixed up, the caliper can hit the spokes on the wheel and cause damage. The inner pads’ backing plate has two ears on the top of the pad that match up to the brake caliper pistons. The outer pad has a chamfer on the top. The pads have the same ears that rest in the lands of the caliper bracket. It is possible to install the caliper over the mixed-up pads and install the guide pins. It is also possible to get two inboard pads on one side and two outboard pads on the other side. 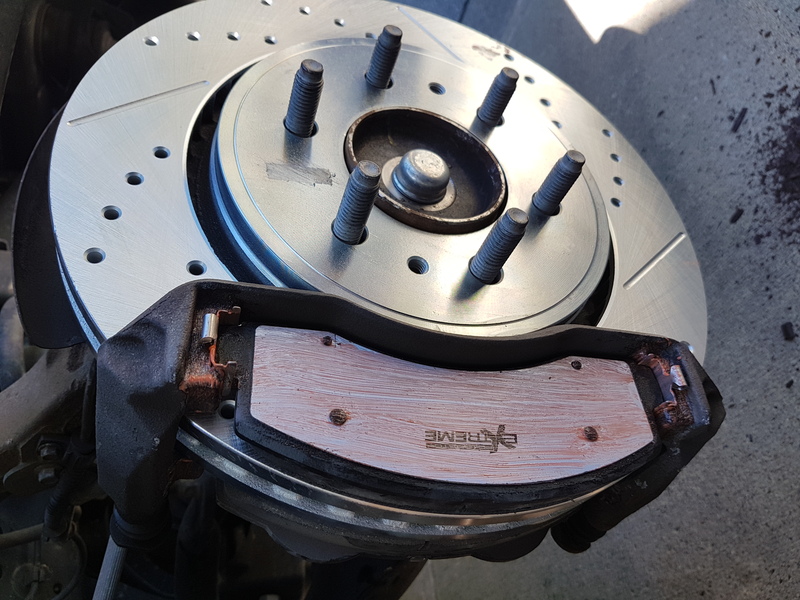 If pads are installed in the wrong positions, when the brakes are applied, the caliper could come in contact with the inside of the wheel. The brake caliper bracket has a torque spec of 184 ft./lbs. The caliper guide bolts have a torque spec of 27 ft./lbs. Last edited by TCP2; 01-10-2019 at 01:10 PM. Lizardking419 and milesej05 like this. -2016 XLT (XTR) 3.5 ecoboost supercrew 6.5' box, max tow, line-x, Bakflip MX4, Firestone ride-rite airbags, Vantech Rack, Alpine PWE-S8 Sub. -Sold: 2009 XLT (XTR pkg) supercrew 5.4l 6sp 6.5ft bed. 131k miles, Rider Topper, Ride Rite airbags, Ford well liners, 5Star custom Tune. I did't file the pad because you will take the coating off the metal. In my case it was the stainless steel strip that fit the hardware bracket too tight. 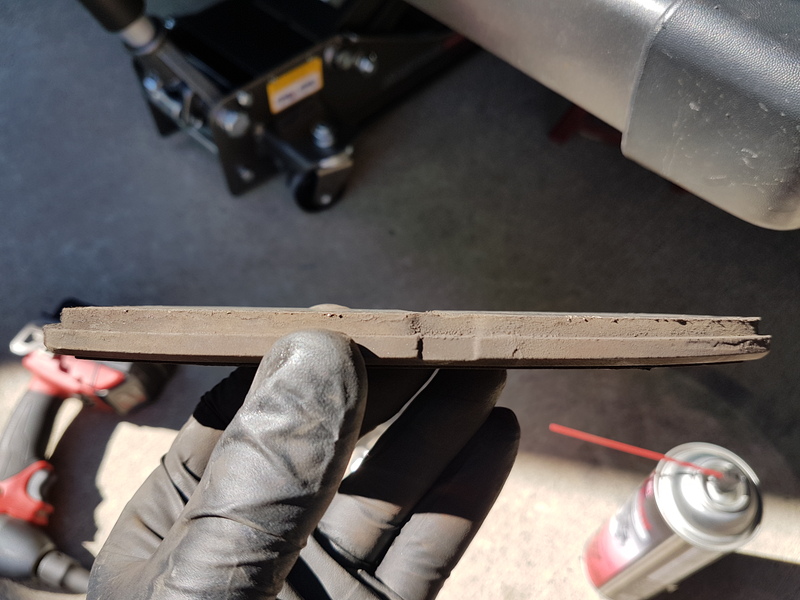 This in turn caused the pad tabs to "stick" when sliding on the guide. I took a wire wheel and brush to those brackets until the hardware went on easily. I'm not sure if these warp or the metal swells, but that's how I fixed mine. Get that slot down to bare metal and then some. Replacement brackets should be okay, when I was looking they were like $50 a side without a core. Seems like you either by third party or replace with an OEM full caliper. Upgraded to powerstop z36. They came with new clips and boots. Where to buy ebc brakes? Installed Spyder tail lights, not impressed.